Over the past year, we’ve helped to make the Bexhill-Hastings Link Road (BHLR) a significant local and national issue; played a major role in enabling and supporting 48 days of peaceful direct action against the project; produced invaluable research on the scheme; organised a peaceful two-day siege of the Department for Transport (DfT); built a ‘dual carriageway’ on the doorstep of George Osborne’s countryside retreat; co-organised a National Rally Against Roadbuilding; and helped generate over 600 objections to the ‘Gateway Road’ proposal (aka The Link Road to the Link Road). With work on the BHLR scheduled to continue until May 2015 – and with the ever-rising costs of the Road leading more people to question it – there’s still plenty of scope to get this scheme scrapped once and for all and deliver a major blow to Osborne’s plans for hundreds of new roads across the UK. And we also need to support those who’ve been arrested during the campaign so far, 19 of whom will be putting the road on trial in six court cases over the next eight weeks. But in order to do all this we need your financial support. To date, the overwhelming majority of our funding has come in the form of individual donations from you, our supporters, and our funds are now very low. 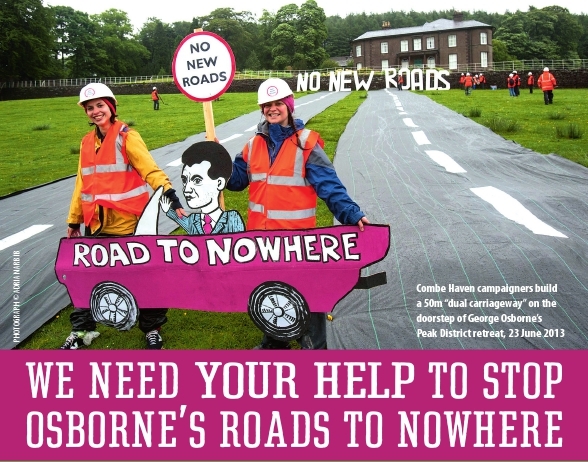 Please help us to continue the campaign to save Combe Haven valley and stop Osborne’s Roads to Nowhere, by making a donation today.